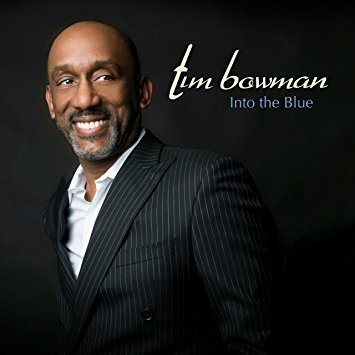 Guitarist Tim Bowman brings his Detroit based gospel, jazz and R&B roots to each of his projects. Those roots run deep, and they can be heard throughout Into the Blue, his latest release. Bowman has a professional and familial (through his sister Vickie Winans) connection with the legendary gospel group The Winans, serving as their guitarist for much of the 1980s. Additionally, Bowman’s son, Tim Jr., is a gospel artist. Detroit has deep R&B and jazz roots as well, and Bowman spent the last 20 years expanding on that connection as a contemporary jazz guitarist, who has released 10 albums, starting with his debut Paradise. Bowman makes that Detroit identity complete by infusing his records with funk and collaborating with R&B vocalists. He continues that trend on Into the Blue – a project that includes strong vocal R&B/jazz number by Stokley, an acoustic and voice collaboration featuring Angela Johnson, and a funky gospel medley fusing “Amazing Grace” and “Wade in the Water” where the elder Bowman elicits help from his son, Tim, Jr. Listeners will also hear Bowman’s work on the Spanish guitar on several tracks, but most notably the pensive ballad “Love Forever More,” while the upbeat “Detroit Funk” includes rock influenced guitar riffs and a bass propulsive and bouncy bass line, while the jazz/funk number “Boss” lands in a laid-back groove that gives space for Bowman to display his creativity as a soloist. Still, more must be said about the vocal contributions of Stokley on “All I Need is Love,” and Johnson on “My Heart To You.” The former is a radio ready track that finds the long time Mint Condition front man deploying his buttery tenor to explaining why all the material possessions and A-list access is no substitute for good, old fashioned love. From an arrangement standpoint, the track balances the contemporary R&B production techniques with Bowman’s work on the six string and solid lyrical content. Bowman and Johnson combine guitar and voice on “My Heart To You,” a tune where the latter expresses her willingness to ignore fear and embrace what she feels. The sparse arrangement provided by Bowman’s guitar serves as a solid foundation for the power and vulnerability that Johnson expresses vocally. Contemporary jazz has taken a hit from the changes besetting the music industry. It’s nearly impossible to hear contemporary jazz on the radio these days, and that’s really a shame because from a creative standpoint, the genre is as vibrant as it has been in years. Bowman continues that trend with Into the Blue, and fans who take the time and effort to look for this record will come away pleased. Recommended.